We managed to get quite a good overview of the excellent Samsung Galaxy S II high-end Android phone since we first got our hands on it not long ago, and are posting links to all our extensive coverage here in a one-stop shop for your convenience. Click on any of the links below to place yourself right in the middle of the topic that interests you about the Galaxy S II. We will be doing some more tests, feature overviews and comparisons with it in the coming weeks, so stay tuned to this post for everything Samsung Galaxy S II-related from PhoneArena. 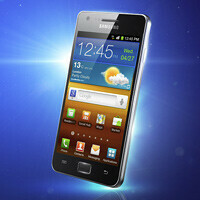 Samsung Galaxy S II Review: We examine in-depth the Galaxy S II design, features, performance and interface, complete with a video review. Samsung Galaxy S II thickness comparison: The Galaxy S II is the thinnest phone with 4.3" display, and we stack it up to some of the other bikini bodies out there. Samsung Galaxy S II vs LG Optimus 2X benchmark comparison tests: Dual-core chipset fight through standardized synthetic benchmark testing, we won't spoil the fun, just look it up, with video to prove. Samsung Galaxy S II Extreme Unboxing: A job you love needs sacrifice - Samsung UK takes our editor Basil Kronfli to do some unorthodox Extreme Unboxing hanging from a cliff in the Snowdonia mountain range. Super AMOLED Plus vs Super AMOLED - to the PenTile matrix and back: We compare the Super AMOLED display on the first Samsung Galaxy S to the new and improved Super AMOLED Plus technology used for the 4.3" screen on the Samsung Galaxy S II. NOVA Display vs Super AMOLED Plus vs Retina Display vs IPS-LCD: An extended comparison of the Samsung Galaxy S II screen to the other mobile display technologies out there. Stay tuned for more home-baked PhoneArena coverage of the Samsung Galaxy S II - one of the finest Android specimen to date. is this a filler post or what!!? That comes in handy. Just to browse them all again! But still, this monster needs to show up on T-mobile soon! Are there any rumored or confirmed dates about when the Galaxy S II is coming to T-Mobile America? Impressive now, but if Samsung doesn't get these on the US shores before mid-June the excitement will fade. Millions of iPhone user's contracts end this June, this is a gigantic opportunity for Samsung, and not just for selling units, but attaining something cultural. That "attaining" pun was not intended, I apologize for my annoyance. Well, I heard that Canada might be getting the Galaxy S II before US and thats suppose to be in July. So US might not see Galaxy S II until August or September.... BUt hopefully before that BEEN DYING TO GET THIS PHONE : X!